The Intelligent Community Forum has announced the twenty-one community candidates for 2015. This year's submissions come from diverse locations ranging from Kazakhstan to Kenya and Taiwan to the United States. The Smart21 represent a cross section of the world with five communities from the United States, four from Australia and four from Taiwan as well as three Canadian cities. Plus one each from Kazakhstan, Brazil, Japan, Kenya and New Zealand. More than 300 communities submitted nominations. I have been a juror for the final seven for several years now, and it has been interesting to read about these communities, as they validate what I have observed in my own work reaching back into the early nineties. The communities that are successful with their broadband initiatives are almost always the ones that have taken the time to answer the question, "What do we want to be in ten years?" "What do we want to offer as a community to keep people here and to attract families and businesses?" Answering these questions is hard work, takes time, and requires developing a consensus in the community about where to invest time and energy. But it pays off with often dramatic results. Another thing I have observed about the top ICF candidates is that they plan and execute for the long haul--that is, they don't think that there are silver bullets out there that will solve all their problems magically. ICF communities succeed because they work at being successful. Via Eldo Telecom, news that in England, people are moving from the country to larger towns because of bad Internet access. As Fred Pilot of Eldo points out (correctly, I believe), rural communities in the U.S. are also at risk. It's hard to imagine how anybody can manage with a dial up connection at home, which of course leads to people parking in the McDonald's parking lot so they can retrieve their email or so their kids can do their homework. 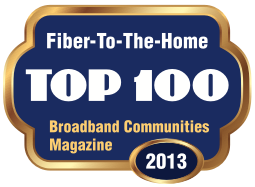 Fred also points to a 2009 study showing that home buyers in the U.S. rank fiber broadband service as the number one amenity they look for in a property . Sometimes little things can have big impacts. The BioLite HomeStove has the ability to make a lot of lives better while reducing tree loss in many parts of the world. The innovative cooking device is a highly efficient "jet" or "rocket" stove that burns small amounts of wood while generating a lot of heat. There are many similar jet stoves, and because they are so good at creating lots of heat quickly, in many impoverished areas, the stoves can dramatically reduce the amount of wood needed to cook food, and make it possible to sterilize water much more easily. The stoves also reduce the amount of work needed to collect wood, which, if you are cooking for a family over an open fire, can be very significant. But the real innovation of this device is the integrated thermocouple that powers a small fan (to make the stove more efficient) and powers a USB port that can charge small portable devices like LED flashlights and cell phones. It is an amazing innovation that has the potential make millions of lives better. The Intelligent Community Foundation has just opened its 2013 Intelligent Community Awards for nominations. This is the first step toward the Intelligent Community of the Year award, to be presented on June 7, 2013. The awards program salutes the accomplishments of communities in developing inclusive prosperity on a foundation of information and communications technology. Nominations are encouraged from communities large and small, urban and rural, in developing and industrialized nations. The evaluation system compensates for population-related factors and lets the ICF compare large, midsize and small communities worldwide on a level playing field. The 2013 theme is "Innovation and Employment." A special section of the questionnaire will examine how Intelligent Communities balance the positive and negative impacts of innovation, which both creates new employment and destroys jobs as it makes old processes obsolete. Look for the announcement later this month on the publication of an ICF white paper on Innovation and Employment. The deadline for nominations is September 21, 2012. The award criteria and nomination form (consisting of just 6 questions) are available here. The ICF also invites communities to take our online self-test to get a feel for how they will be evaluated. The ICF will announce the next Smart21 Communities of the Year in October at a ceremony in Riverside, California, USA, the 2012 Intelligent Community of the Year. Disclaimer: I serve as a juror for the awards evaluation. The FBI says that you might want to leave your laptop home when traveling overseas. The latest scam is from criminals who set up bogus WiFi networks that look just like the real hotel network. When you fire up your laptop, you get what looks like the real hotel login page, but it is a fake one that immediately loads zombie malware onto your computer. Another trick they use is to have a fake "software update needed" window pop up. Everyone is now so used to getting these automatic software update notices that criminals are taking advantage of the fact that everyone automatically clicks "OK" for these upgrades. The same thing happens: instead of an upgrade, your laptop gets loaded with malware that starts capturing credit card numbers and login information. U.S.Broadband: Almost as good as Northern Balochistan! Long time readers of this blog know that I have a running joke about comparing the state of U.S. broadband infrastructure to other countries. The latest insult is Northern Balochistan (part of Pakistan), which is getting a 1,100 kilometre fiber build. Meanwhile, our rather measly national goal is 4 meg down, 1 meg up, which won't support work and business from home applications and is barely adequate for Netflix. SandMonkey, a prominent Egyptian blogger who was briefly detained by Egyptian security forces, advocates that opponents of repressive regimes should store all their documents, writing, and information (e.g. email addresses and data on compatriots) on a cloud-based service located in a different country. That way, if a laptop is confiscated, there are no incriminating documents on it. It's a fascinating view of an emerging technology, and of course, terrorists can do the same thing. As always, technology is politically neutral. But there is no doubt that bloggers and the technology of the Internet is changing politics, mostly for the good, by making it harder to hide graft, corruption, nepotism, and incompetence. Many parts of rural England, like many rural areas of the U.S., have "little" broadband speeds of just a few hundred kilobits, as opposed to "big" broadband delivered via fiber with a capacity of a hundred megabits or more. A speed test was recently conducted in Yorkshire, England. The goal was to download a 300 megabtye file by a "little" broadband connection and see if that was faster than sending it 120 kilometers by pigeon. The pigeon won. They strapped a USB thumb drive to the pigeon and it flew the 120 kilometers in one quarter of the time needed to download the file. Silly? Sure, sort of. But it really shows why little broadband is not enough for rural America.